Monday, January 26, 1914: Nothing to write. Since Grandma didn’t had “nothing to write” a hundred years ago today, I’ll share pictures of hairstyles in the February, 1914 issue of Ladies Home Journal. Posted on January 26, 2014 January 25, 2014 by SherylPosted in FashionTagged 1914, family history, genealogy. Beautiful hairstyle… I’m thinking Miss Muffly that you only wrote in your diary when something of interest happened in your life and then went back and filled in with comments like this on 26 Jan 2014. Well, that is what I would have done at your age I reckon 😆 Thanks Sharon for researching and providing such interesting info from those times. These hairstyles are lovely. I like them more than the ones for 1911 and 1913, although they are lovely, too. so wavy and flowy. The 20’s with their flapper dresses and short lady’s hair with head bands is only a few years away. I always think of that time as a huge change. Helena would have been in her mid to late 20’s then. I wonder what she thought of the 20’s. Grandma reminds me of myself on days I don’t know what to write about on my blog: do you suppose I could get away with “Nothing to write”???? Most women went through quite a bit to get that wavy hair! I think they must have been quite time-consuming these lovely styles. Do you know where your grandma had her hair cut? I think salons must have been few and far between and expensive. I suppose that may be why so many of my forbears were photographed with long hair pinned up, hidden under a hat? Her hair was long and pinned up when I was a small child. When she was older (in her 70s and 80s)– she cut her hair and wore shorter styles. I wonder if they always curled their hair first before pinning it up or if that is how their hair looked without flat irons 😉 and our hair products like conditioner. I thing the ladies went through a lot to get those perfect permanent waves. Now I have to go back and see what hair styles my grandmothers were wearing in 1911 – 1914 or so. I know they both had very long, wavy hair. Just watched the video on the Gibson girl hairdo. Interesting. I agree! They are looking more modern from the front. There is a hint of the marcel waves of the 1920s evolving here. 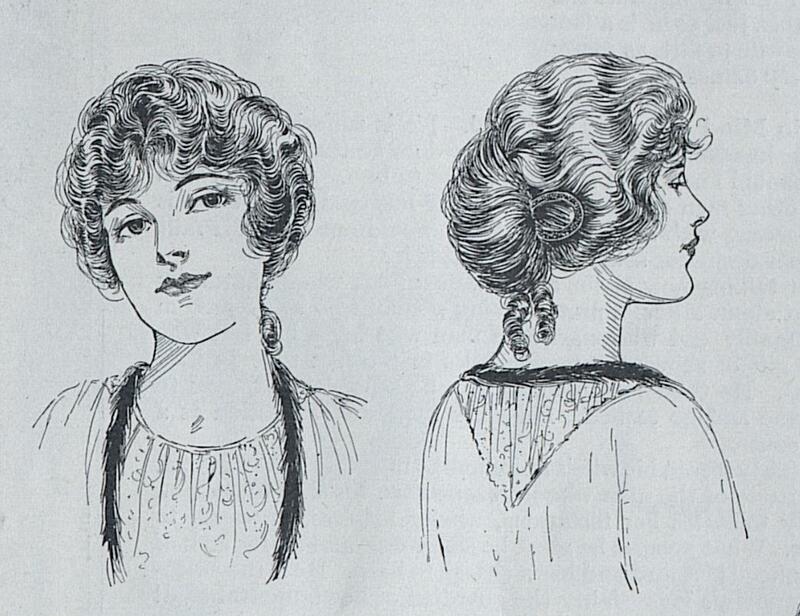 The back part of the hairstyles is still rather Edwardian or Gibson Girl in feeling.